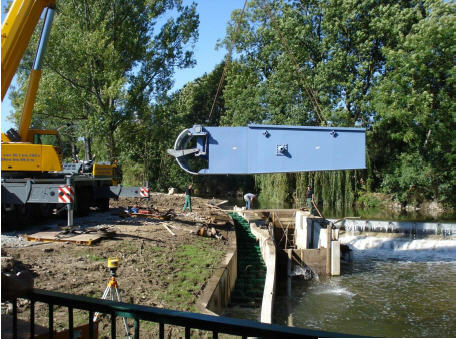 A unique and completely new type of pivoting hydroelectric power station which is completely immersed in water, is now in operation and available for the UK market. The station is invisible, has low noise emissions and meets today’s tough expectations for environmental protection. This encapsulates, within a packaged solution, all the screening and other biodiversity benefits normally associated with the longstanding bespoke and artisan OSSBERGER approach. 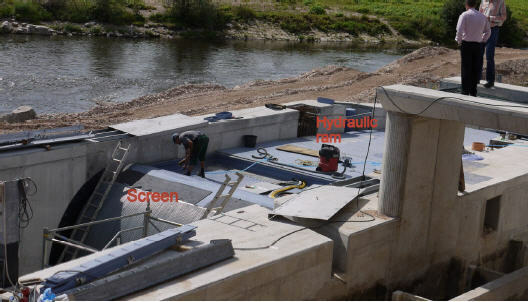 In addition to fishery protection this packaged hydropower system has many advantages – both in construction and long term operation. 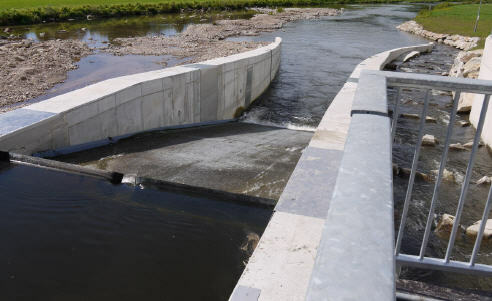 In terms of construction all civil structural work for the first prototype power station was completed in under a year with little visible above ground other than what appears to be a new weir. The system operates quietly and out of sight as a result of completely submerging the turbine and housing beneath water level. This represents an absolutely new concept which has been developed over a five year period in response to an EU LIFE research project. Over this time OSSBERGER have researched and gained experience to better understand the best ecologic and economic utilization of ultra-low head sites for hydro power. Such low head sites are widespread – they are generally well known and identified. Worldwide, numerous such unexploited sites, offering heads of less than 5 meters, exist. With this new concept, many can now be developed without extended head or tailrace sections, or other obtrusive works, for quicker approval by the authorities. A range of units of different sizes are available for utilizing larger flows, with correspondingly sized structures and plant components. Low-head installations are particularly sensitive to head losses, which can happen due to back-up in the tail water level. The problems of partial or fully blocked trash racks due to river debris, and narrow screen spacings for fish protection, are addressed here, with a self-cleansing mechanism that re-directs and guides such debris around the power station. This system can thus receive a flood surge laden with debris, totally submerging the installation and continue operating regardless. This is unlike other hydro systems and a major cost benefit in the long term operation since such events can entail a costly recovery, clearance or repair process. Fishery sensitivity requires tough environmental standards that demand novel solutions to protect fish and their habitat. 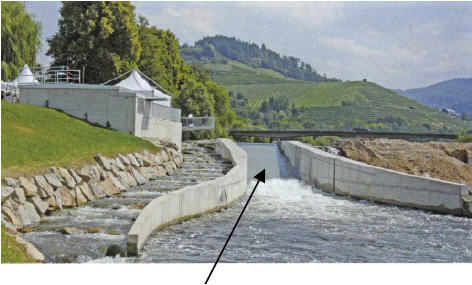 Here, fish are able to pass around the turbine housing, either near the surface or at the river bed level with this advanced understanding of combining hydropower and fisheries. 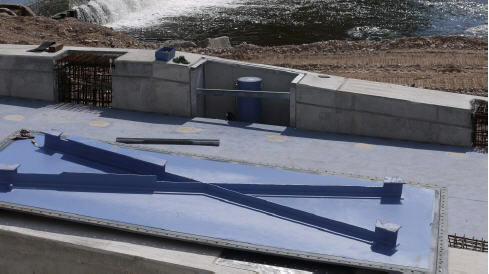 These requirements lead to a common, yet unique, standardized design of enclosed power house, trash rack screen, adjustable weir, turbine and generator, inclusive of intake and discharge passage. This design leads to be easily reproducible sites and simplifies civil works to reduce risk during construction. Another very novel advantage resulting from this design comes from the “ejector effect”, which emanates from accelerated flow velocities at the draft tube end. This effect is well known amongst hydraulic engineers, and is similar to a Venturi effect. 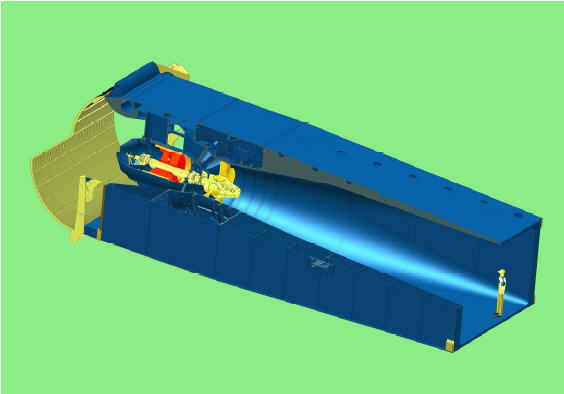 It arises from the design of the channel section and the placement of the turbine unit within this and is a unique benefit of this design. The ejector effect permits extraction of residual energy at higher discharge rates, thereby obtaining extra power output. Of most importance is the compactness of the enclosed unit, characterized by an efficient turbine design, using an OSSBERGER HSI Kaplan bulb turbine coupled to an efficient generator design without the need of a gearbox. For some years now, “permanent magnet-excited generators” (PMG) have found an application in the field of hydro power. This generator type has been robustly proven with Kaplan bulb turbine units resulting in significant efficiency benefits due to avoidance of power losses within the exciter system. Even more important is the exceptionally slender body form of PMGs, i.e. they can be built at smaller diameters for greater hydraulic efficiency. Additionally, no cooling is necessary for the field windings or the electronic circuits of the exciter. This all results in a type of generator which is robust enough to compare favourably with an induction generator, lighter in weight, more compact, and improved efficiency. The PMG used for the Enclosed Pivoting Kaplan can be grid connected without the need of a separate transformer. As already mentioned, the first bulb generators for immersed design were tested with a turbine housed inside a conventional power house. The great reliability and performance was an important part of the decision to use them for the Enclosed Pivoting Kaplan. Corrosion-resistant materials for the permanent magnets were of high importance – offering only small variations in field strength, at varying temperatures. The generator voltage can be adapted to suit local mains voltage. The design of the pole shoes and the damper cage provides optimum protection against demagnetization and guarantees an optimal voltage curve. This leads to extremely smooth operation and in association with low-loss dynamo sheet materials to high efficiencies (over 96% has already been obtained at only 15 % of nominal power). In addition to all these features, a continuous control of the inner bulb pressure monitors the shaft seal condition (generator shaft = turbine shaft). The hydraulic drive machine is a double regulated Kaplan Turbine from the current production series, which has its greatest advantage in the middle and low head range. The turbines used for the Enclosed Pivoting Kaplan are known for their outstanding solid construction, ease in installation and maintenance and provide high efficiency and long life expectancy. The first unit with a water-cooled permanent magnet generator powered by an OSSBERGER HSI Turbine has been in operation since 2007. At a speed of 214 rpm, a generator efficiency of more than 96% has been measured. The first Enclosed Pivoting Kaplan was installed at 1.7 meters head and a nominal flow of 4 m³/sec – this achieved a maximum output of 55 kW. It was essential to fully examine the hydrostatic buoyancy of this relatively small unit and to rigorously test the newly designed bow-shaped screening system in front of the unit, as well as the ejector effect and the flow pattern around the unit. As a result of the successful initial prototype experience, a chain of power stations was planned in Southern Germany. The first one with a nominal capacity of 550 kW was connected to the grid in the summer of 2010, another one is at the stage of installation. Further advantages of the concept have become apparent during construction of the 550 kW station. The mounting and channel structure could be built within a half-year and the control room was erected during the same period. The Enclosed Pivoting Kaplan unit itself was assembled at the manufacturer’s works as a complete unit and under went dry-run performance testing. This included a generator test run, setting of wicket gates and runner blades, testing the newly developed bow-shaped trash rack cleaner with a synchronous monitoring feature, testing the flushing flaps mounted on top of the power station and testing of all other sensor equipment. Control and communication systems and full automation are essential at power stations. Diagnostic, decentralized inputs and outputs for the programmable logic controller are important for remote sensor diagnostics. To reduce the wiring between the control room and the Enclosed Pivoting Kaplan all measuring and control signals from the decentralized sensors are transmitted via Local Area Network cabling. The LAN double fibre optic cable assures good availability and reliability preventing over voltage situations. After successful conclusion of all tests at the manufacturer’s plant, the unit was transported to its destination in two loads of 8 and 10 meters lengths, respectively. 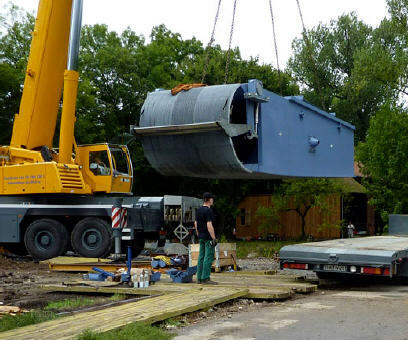 On site, both pieces were reassembled and lifted into the ready made mounting/channel structure using two cranes, with 350 tons lifting capacity, simultaneously. According to the Project manager – “this was a precision job, requiring millimetre accuracy, but it worked perfectly from the start”. Even after then, the project progressed well. First commissioning took place less than four weeks after the lift-in. Since then, the operating experience has exceeded both the manufacturers and clients expectations. Despite the small spacing between the screen bars on the intake –15 mm wide – only small head losses are experienced through the screen. The cleaning system works efficiently and fast, the debris is transferred promptly using the movable arms. Regulation of the upstream water level is achieved by means of the weir flaps and the lifting device of the Enclosed Pivoting Kaplan. The overall efficiency that was promised was clearly demonstrated and confirmed. The ejector effect experienced from the accelerated discharge flow exceeded initial expectations. Neighbours and visitors alike were particularly impressed that machine noise did not disturb the tranquil setting. The machine is barely audible over the natural sound of the river. With a gross head of 3.2 meters, this power station was designed for a nominal flow rate of 20 m³/sec. A power output of 550 kW was achieved at the generator terminals. The generator was rated at 600 kW to allow for a power increase at larger discharge rates. Such high power values are achieved by this plant, when conventional low-head turbines drop off or even be shut down due to tail water back-up or wash out during very high flows. With a back-up of 45 cm and a flow rate of 55 m³/sec. a conventional plant would lose more than 20% of the power produced. With the Enclosed Pivoting Kaplan in a position such that the flow is passing beneath and above the unit, the ejector effect increases the power output by up to 8% above its rated value. The first plant has now been operational for some time. Apart from energy production, ecological improvements are also achieved with this plant. The continuous fish passage upstream and downstream enables migrant fish like salmon to pass the power station without problems. With the best scientific understanding, this enclosed turbine, generator and screen, which can be pivoted by hydraulic cylinders, offers the best possible hydropower solution for protection of fish and water. Even bottom dwelling fish, such as endangered eels, can pass by without any problems. Consequently, the ecological production of electricity and the protection of the river are added benefits of this investment. This is a big improvement on our usual thermal power sources (coal, nuclear etc); which are the biggest abstractors of all from UK rivers and estuaries. This novel approach achieves a higher level of fish protection and other benefits – most notably resilience against flood washout. Here you can see the ‘Enclosed Pivoting Kaplan’ receive a major flood surge, and continue operating regardless; the conventional hydropower site just downstream was shut down for days, requiring divers and heavy plant at high cost to recover function.